Fenugreek tea is made from the seeds of the fenugreek plant, which goes by the scientific name Trigonella foenum-graecum. The plant is also known as Greek Hay and is an annual herb that grows along the eastern coastline of the Mediterranean Sea. The genus name Trigonella comes from old Greek, and it means “three-angled,” which is an apt description of the corolla of the plant. Throughout history, cultures have used it as a cooking ingredient, perfume, and even as an aphrodisiac. The plant grows up to two feet in height and is often branched at its base. The plant has pale yellow flowers and gives off a strong, sweet aroma. It often contains up to 20 seeds, which are light brown in color, in a single pod. The Egyptians were among the first civilizations to harness the therapeutic properties of fenugreek seeds and use them in traditional medicines. The Chinese also used it to make their medicines and cures. Some of fenugreek tea’s uses are popular even today. People consume fenugreek tea to make use of its many reported health benefits like soothing menstrual cramps, reducing the blood sugar levels in your body, facilitating digestion, and protecting the heart. It’s also thought to help in removing inflammation, stimulating libido, increasing blood circulation, and removing the toxins in the body. As with anything, drinking too much fenugreek tea can be harmful for your health. People who are allergic to fenugreek and other plants in the Fabaceae family like soybeans should steer clear of it. Drinking in excess could lead to unwanted side effects like diarrhea, bloating, congestion in the nose, and swelling of the face. Fenugreek tea has a high percentage of iron but is deficient in other minerals. It has a significant amount of dietary fiber, trace amounts of vitamin C, and some fat content. It also contains 12 grams of carbohydrates. Since ancient times, women have been using fenugreek to stimulate and increase their milk flow. It is believed that the oil in fenugreek gives it this quality. A 2012 study review of breastfeeding and herbs, published in the journal Breastfeeding Medicine, named fenugreek as one of the most potent herbal galactagogues (substances used to promote lactation). Even though further research is required on this aspect of fenugreek, in tea form, it’s considered healthy for women who want an adequate milk supply to breastfeed and nourish their babies. How Long Does It Take for Milk Production? Some may see an increase in production 24 to 72 hours after ingesting fenugreek, but it might take up to two weeks to have the same effect on other women. Fenugreek tea has often been used for both short-term and long-term needs to boost milk supply or pumping yields. How Often Should You Drink Fenugreek Tea in a Day? You should consult your lactation consultant and physician to get information about the right fenugreek tea dosage for your specific circumstances. The suggested dosage is usually one cup of tea, two or three times a day. Fenugreek seeds are full of antioxidants, so drinking the tea may help in managing several inflammatory diseases such as arthritis and gout. In a January 2012 study published in International Immunopharmacology journal, researchers found that the polysaccharide substances in fenugreek displayed anti-inflammatory and antioxidant effects on arthritic rats. Fenugreek tea contains water-soluble fiber that can help treat constipation. It does this by drawing water into your bowels and forming a gel-like paste that softens stools. The seeds have anti-inflammatory properties, so the tea helps treat conditions like ulcerative colitis among drinkers. 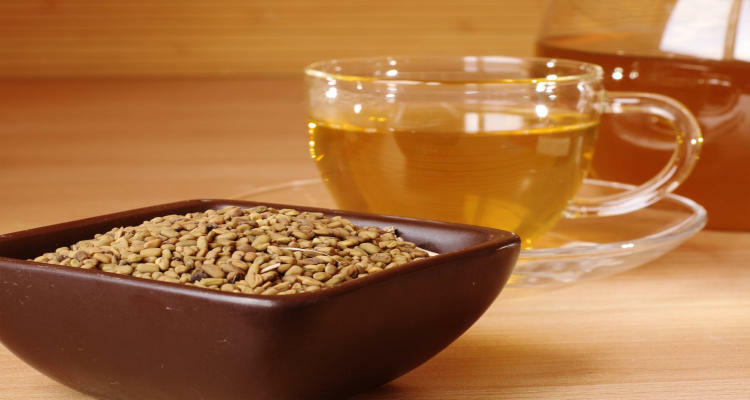 Chinese traditional medicine has used fenugreek tea to treat digestive issues for thousands of years. There are credible sources which suggest that drinking fenugreek tea after meals can help in digestion. According to a study published in the Journal of Reproduction & Infertility, issue January-March 2014, fenugreek seed powder may be helpful in relieving the severity of dysmenorrhea, or painful menstrual cramps. It follows logically that drinking fenugreek tea may have the same positive effect on its drinkers. Diabetes is an epidemic threatening to overwhelm patients and health care providers all over the world. Fenugreek tea may help deal with this malaise by lowering blood sugar. According to a 2017 study, published in the journal AYU, its consumption leads to a reduction in blood glucose levels. It also helps in regulating insulin production and release in the body, which can give diabetic patients a better chance of surviving the disease and living a more regular life. Fenugreek tea helps prevent many of the spikes and drops in blood sugar and remains an effective complementary treatment in controlling diabetic symptoms. Trigonelline, a compound in fenugreek, has been found to have brain-boosting effects. According to a 2016 study published in the journal PLOS One, research into this quality of fenugreek suggests that drinking its tea may prevent age-related memory loss and other serious brain diseases like Alzheimer’s and Parkinson’s. Researchers found that it reduced aluminum chloride-induced memory and learning impairments and aluminum toxicity, thereby potentially preventing brain disease. Fenugreek tea is beneficial to people suffering from respiratory infections because it can both eliminate mucus and phlegm and neutralize the underlying pathogen. It contains powerful antioxidant vitamins such as vitamin C to stimulate the production of white blood cells, which are the body’s principal line of defense against microbial pathogens. Fenugreek tea made from germinated seeds shows higher antioxidant activity and helps fights free radicals to prevent premature aging. You can either drink the tea or mix the seeds with yogurt to form a paste and apply it to your face twice daily. Let the paste sit on your skin for 30 minutes and then rinse clean with cold water. By using this method, you can treat acne and blemishes as well. The lactic acid in yogurt acts as an exfoliant, thereby improving the overall health of your skin. Studies suggest fenugreek tea possesses appetite-suppressing qualities that make it ideal for people who want to reduce their weight. It contains several critical nutrients, including water-soluble fiber, which increases satiety and prevents you from overeating or snacking unnecessarily between your regular meals. A 1995 study published in the journal Steroids has shown that steroid saponins from fenugreek seed extract can lead to a lowering of plasma cholesterol in rats. Other studies indicate that fenugreek tea can lower blood pressure. These two properties of fenugreek are essential for good cardiovascular health because they significantly reduce the chances of you developing atherosclerosis. This in turn reduces the chances of you suffering a heart attack or stroke. Anticoagulant properties also give you a reduced risk of developing blood clots. Some may experience uncomfortable digestive problems like gas, stomach pains, bloating, and diarrhea. Drinking fenugreek tea may lower your blood sugar levels, which can lead to hypoglycemia if not monitored carefully. Symptoms may include dizziness, hunger, sweating, and an irregular heartbeat. People with diabetes who are currently on medication to control blood sugar should totally avoid drinking fenugreek tea, to prevent increasing the effects of these drugs. Drinking fenugreek tea may cause the muscles of the uterus to contract, which can lead to premature labor in pregnant women. Consumption during pregnancy may also produce an unusual body odor in the baby. Those who are allergic soybeans, peanuts, and other plants in the Fabaceae family may experience negative reactions upon consumption of fenugreek tea. This fenugreek tea recipe is easy to follow. Check out the steps below! A single teaspoon of fenugreek seeds yields one cup of tea. Crush the fenugreek seeds gently with the flat end of a chef’s knife, as this will release the flavor and chemicals of the seeds. These give you the benefits of fenugreek tea. You can add other herbs and tea leaves to the fenugreek seeds to get a different flavor. Place these ingredients along with the crushed fenugreek seeds into a tea strainer. According to your preference, you can also make tea from fenugreek seeds alone. Transfer the strained tea to a small pan. Add around one cup of water for every teaspoon of seeds. Let it simmer for two to three minutes, and then let it steep for around 10 to 15 minutes. You can serve your fenugreek tea either hot or cold. Depending on your tastes, you can add milk or a sweetener. Adding freshly grated nutmeg and a twist of lemon will do wonders for your carefully made fenugreek tea. You can buy fenugreek tea from your local grocery store or supermarket. You will most likely find fenugreek tea brands stored along with other herbal teas in the herbal tea section. You can also purchase it online from major online retailers. Just be sure that the fenugreek tea you buy is made from high-quality ingredients. Fenugreek tea is made from the seeds of the fenugreek plant, Trigonella foenum-graecum. When consumed in moderation, it has many potential health benefits, such as improving heart health, aiding digestive health, managing inflammation, relieving menstrual cramps, and helping in diabetes treatment. Science suggests it also helps in boosting the immune system and brain function, battling aging, managing weight gain, and increasing milk supply during breastfeeding. However, in excess amounts, it may lead to several side effects such as gastrointestinal problems, lowering of blood sugar levels, uterine contractions, and allergies, especially among people allergic to the Fabaceae family of plants. Fenugreek tea is readily available in grocery stores, supermarkets, and major online stores. It offers so many health benefits, regardless of your health status, that drinking a cup of fenugreek tea at least once a day may worth adding to your health regimen. So, when it’s tea time, try to make it fenugreek tea time! Staughton, J., “9 Incredible Benefits Of Fenugreek Tea,” Organic Facts, June 6, 2018; https://www.organicfacts.net/health-benefits/herbs-and-spices/fenugreek-tea.html, last accessed November 20, 2018. “Discover Why Fenugreek Tea Has Stood the Test of Time,” Mercola, May 5, 2018; https://articles.mercola.com/teas/fenugreek-tea.aspx, last accessed November 20, 2018. “Nutrition Facts,” myfitnesspal, https://www.myfitnesspal.com/food/calories/fenugreek-tea-tea-554067478, last accessed November 20, 2018. Petit, P. et al., “Steroid saponins from fenugreek seeds,” Steroids, Oct. 1995;60 (10): 674-680; https://doi.org/10.1016/0039-128X(95)00090-D, last accessed November 20, 2018. Sindu, G. et al., “Anti-inflammatory and antioxidative effects of mucilage of Trigonella foenum graecum (Fenugreek) on adjuvant induced arthritic rats,” International Immunopharmacology, Jan. 2012; 12 (1): 205-211; https://doi.org/10.1016/j.intimp.2011.11.012, last accessed November 20, 2018. Tadimalla, R., “11 Incredible Benefits Of Fenugreek Tea + How To Make It,” STYLECRAZE, June 26, 2018; https://www.stylecraze.com/articles/amazing-health-benefits-of-fenugreek-tea/#gref, last accessed November 20, 2018. Prema, A., et al., “Fenugreek Seed Powder Nullified Aluminium Chloride Induced Memory Loss, Biochemical Changes, Aβ Burden and Apoptosis via Regulating Akt/GSK3β Signaling Pathway,” PLOS One, 2016; 11(11): e0165955; https://www.ncbi.nlm.nih.gov/pmc/articles/PMC5125597/, last accessed November 6, 2018. Younsey, S., et al., “Effects of Fenugreek Seed on the Severity and Systemic Symptoms of Dysmenorrhea,” Journal of Reproduction & Infertility, Jan. to Mar. 2014; 15 (1): 41-48; http://www.jri.ir/article/553, last accessed November 20, 2018. Budzynska, K., et al., “Systematic Review of Breastfeeding and Herbs,” Breastfeeding Medicine, Dec. 2012; 7(6): 489–503; https://www.ncbi.nlm.nih.gov/pmc/articles/PMC3523241/, last accessed November 20, 2018. Ranade, M. and Mudgalkar, N., “A simple dietary addition of fenugreek seed leads to the reduction in blood glucose levels,” AYU, Jan. to June 2017; 38(1-2): 24–27; https://www.ncbi.nlm.nih.gov/pmc/articles/PMC5954247/, last accessed November 20, 2018. Bonyata, K., “Fenugreek Seed for Increasing Milk Supply,” kellymom, May 31, 2018; https://kellymom.com/bf/can-i-breastfeed/herbs/fenugreek/, last accessed November 20, 2018. “Brewing Fenugreek Seed Tea,” SFGATE, https://healthyeating.sfgate.com/brewing-fenugreek-seed-tea-5281.html, last accessed November 20, 2018. Bae, J. et al., “Fennel (Foeniculum vulgare) and Fenugreek (Trigonella foenum-graecum) Tea Drinking Suppresses Subjective Short-term Appetite in Overweight Women,” Clinical Nutrition Research, July 2015, 4(3):168-174; https://synapse.koreamed.org/DOIx.php?id=10.7762/cnr.2015.4.3.168, last accessed November 20, 2018.